We are thrilled to say one of our staff at 18 Reasons will cook April's Community Dinner. You may have met Elise if you volunteer with us, or were a student at last year's Teen Culinary Immersion, which she coordinated. 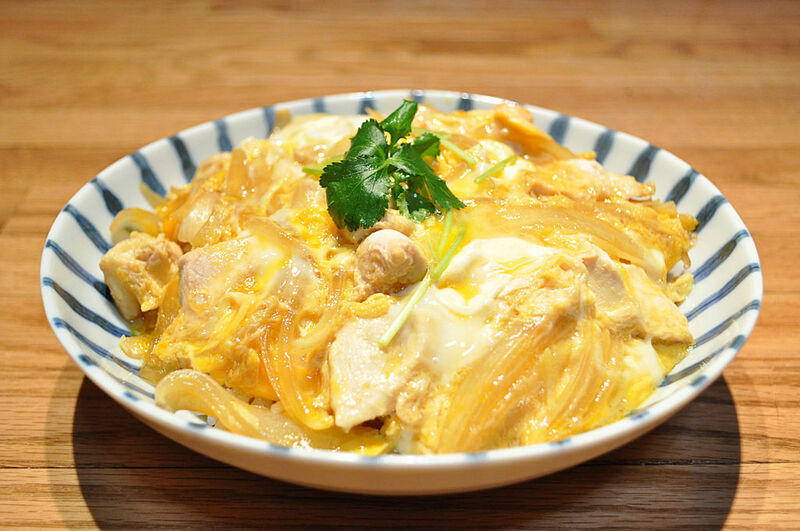 Elise will be cooking up a huge batch of oyakodon, a Japanese staple made with chicken and eggs over rice that directly translates to "parent-child." The poetic nature of both elements simmering together has made this dish a common staple for a family dinner, and also a menu item in acclaimed restaurants throughout Tokyo. Growing up, Elise would come home to a pot of oyakodon surrounded by a cloud of freshly opened kimchi. It didn't matter if the rice was freshly steamed or microwaved from a cold Tupperware, the first bite always encapsulated the comfort of being home. She hopes to share this feeling with all of you by serving simmered oyakodon over a steaming bowl of rice with a side of perfectly pungent kimchi. *if you have any allergies, please let us know at info@18reasons.org. We are cooking in a large batch and may not be able to accommodate every request. Born to Japanese-Korean parents in Northern Colorado, Elise Hayashi grew up in a family where knowing how to use a paring knife was more important than riding a bicycle. This sparked her passion for food and cooking at an early age, and she enthusiastically relocated to the Bay Area to pursue a degree in nutrition science. She also concurrently dabbled around the restaurant industry as a pastry assistant to fill her free time with galettes and mousses. Her time spent working and cooking on a farm deep in the heart of Japan's Saitama prefecture developed a rooted appreciation for the impact that food can have, while also defining her cooking style. Now, she is excited about being a part of 18 Reasons to merge her gastronomic backgrounds and to share her love of food with the Bay Area community. She currently is serving her second year with AmeriCorps at 18 Reasons, coordinating Cooking Matters programming in the Bay Area. Once a month, we open our doors to friends new and old, welcoming all to our share a table and a delicious meal. Every month is something different, but it's always $15 and always tasty. Wine and beer are for sale at the event. Kids welcome! For our second seating at 7:30 pm, please click here.